Appropriately named the Wire Fox Terrier has been known to be somewhat of a live wire character as well. They are extremely adventurous and adore playing outdoors for hours. They bode excellent exploring abilities as well as chasing and hunting small vermin. They can occasionally get into trouble by digging and barking, but overall it is their energetic attitude that simply needs some time to exert itself to avoid getting into any mischievous activities. They are more aggressive and combative than their siblings the Fox Terrier (Smooth) breed. A little quiet around strangers that enter their homes, but not aggressive. They also are very affectionate, playful and can be very easy to train as pups. They have the ability to reside in or outdoors, but would prefer to have a lifestyle that permits them to do both equally. Great watchdogs, but lacking in the protection department. The Wire Fox Terrier breed is one that will require a family that permits them to have the ability to roam and play and expend all of their energy during the day. They are very lively animals and fun loving, which does mean they will want some attention from their families as well. Even though they are highly capable of residing in an outdoor environment, they will live a more productive and pleasant lifestyle in one that permits them to go in and outside as they please. A home with a fence in yard is ideal for these dogs. Their wire fur coats will need attention as well, in the form of grooming a minimum of two times each week is best. If your Wire Fox Terrier is a household pet, they can get by with minimal shaping needs, where as one that is used in dog shows will need stripping or eve clipping by a groomer. This breed is simple to care for as the Wire Fox Terrier does not generally run into any major health concerns at is ages. They can develop conditions such as lens luxation, distichiasis, Legg-Perthes and cataracts. In rare occurrences, they can develop hearing loss and patellar luxation as well. Some screening the vet may recommend will be to check their hearing as they age. The average lifespan for a Wire Fox Terrier is from ten to thirteen years long. Beginning their existence in the 17th century, the Wire Fox Terrier was first noted in England, like much of the similar Terrier breeds. They were a popular choice for show dogs and very good hunters naturally. They begin to gain their fame as great show dogs after the success of the Smooth Fox Terriers were already established in that demographic. There is a Fox Terrier Club by the AKC in which they decide to separate the Fox Terrier breeds into their own respective sections. 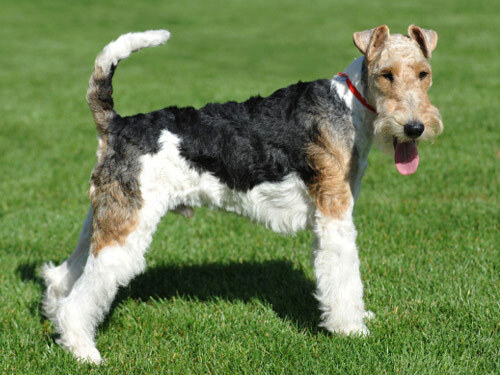 Once that changed had progressed, they were gaining popularity as household pets and considering they were no longer interbred, that was the sensible decision to divide the Fox Terrier into their own groups.